A great diversity of life depends on the Cahaba River, with Alabama’s longest remaining stretch of free-flowing river, the primary drinking water source for one-fifth of the state’s people in the Birmingham metro area, and a treasure of biological diversity of national and global importance. The Cahaba River is one of the most biodiverse waterways on Earth. It has more species of fish than any other river of its size in North America. Recent publications from The Nature Conservancy and the World Wildlife Fund have emphasized the global significance of freshwater biodiversity in the Southeast. The Cahaba River was noted as one of only eight “Hotspots of Biodiversity” out of 2,111 watersheds in the contiguous United States by The Nature Conservancy(1). In a global study of significant ecosystems and species, The World Wildlife Fund designated the Mobile/Tennessee/Cumberland river system as among the 19 highest priority places to save on the planet in the next decade(2). Another notable accolade is from the National Geographic Society. Their new National Geographic College Atlas of the World (2007) includes a two-page spread (pages 40-41) on biodiversity. 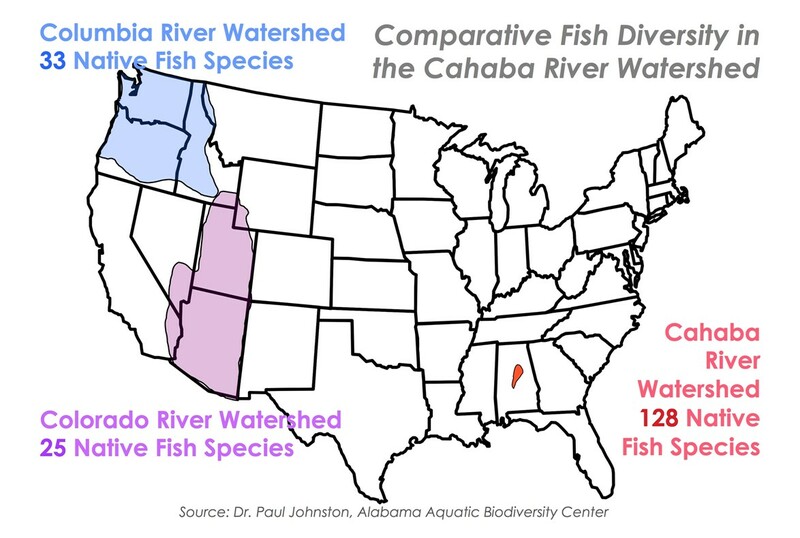 Southeastern US Rivers and the Cahaba River are specifically noted as one of six biologically rich areas in the world threatened by “habitat loss and fragmentation, invasion by non-native species, pollution, and unsustainable exploitation…” which follow from economic activity and population growth(3). In September 2007 the Sierra Club published America’s Wild Legacy(4), which designates “The 52 most important places to protect within the next 10 years”. In Alabama, the Upper Cahaba River was selected as that focus. This recognition underscores the need for our community to accept the responsibility to protect this important river resource. We have no guarantees this remarkable ecosystem will be healthy in the future. In many respects, the Cahaba River shows significant signs of degradation. The loss of biodiversity that has already occurred in the Cahaba River is an undeniable reflection of our failure to sufficiently address problems with excessive siltation and sedimentation, excessive nutrients, stormwater toxins, and hydrological alterations that currently are impacting this river basin. The Cahaba River has more fish species per mile than any other river of its size in North America(5). The Cahaba River supports 69 rare and imperiled species, including 10 fish and freshwater mussel species listed under the US Endangered Species Act(6). The Nature Conservancy has purchased the 300 acre Barton’s Beach along the Cahaba River in Perry County(7). The US Congress has created the 3,500 acre Cahaba River National Wildlife Refuge (CARNWR) and approved another 3,500 acre expansion if willing sellers are interested. This Bibb County refuge is administered by the US Fish & Wildlife Service(8). The Cahaba River historically supported 50 different freshwater mussel species(9), 24 different native freshwater snail species(10), and 124 native freshwater fish species(11). Eight previously undescribed plant species were recently discovered on the Bibb County Glades(12) next to the Little Cahaba River. Sixty one rare plant species have been described from these unusual Ketona limestone glades(13). The Southern clubshell and the Ovate clubshell are two rare freshwater mussel species that have, until recently, not been seen in the Cahaba River for over 40 years. However, Dr. Paul Johnson, with the Alabama Aquatic Biodiversity Center at Marion, AL., has located a very few individuals from the Cahaba near Centreville, Alabama. The Cahaba pebblesnail, our only endemic Cahaba freshwater snail, once thought to be extinct, was relocated by Dr. Stephanie Clark, then with the University of Alabama(14). About 106 miles of the Cahaba River’s 190 mile mainstem length has been placed on Alabama’s §303(d) list of waters that do not meet current water quality standards for habitat alteration due to excessive amounts of sediment and nutrients(15). Another 30 miles of Cahaba River tributaries add to that list. Excessive sedimentation and nutrients, along with stormwater toxins, and hydrological alterations have been accompanied by a 20-40% decline in the number and species richness of fish sampling results over a recent 20 year interval (as of 2002)(16). The Blue shiner, Cyprinella caerulea, has been extirpated (no longer found in the Cahaba River, although it can be found in a couple of other rivers in Alabama and Georgia) from the Cahaba River. The range of the endangered Cahaba shiner has decreased from about 90 to 15 miles in the Cahaba River (happily, however, a population of Cahaba shiners has been located in the Locust Fork River(17)). The number of mussel species that may still be found in the Cahaba River has decreased from about 50 species down to about 27 species. National Geographic College Atlas of the World (2007). Washington, DC: National Geographic Society. Wiley. Mayden, R.L. and B.R. Kuhajda. 1989. Systematics of Notropis cahabae, a new endemic to the Cahaba River of the Mobile Basin. Bull. Al. Museum of Natural History. Vol. 9: 1-16. Allen, W. 2001. Cahaba River National Wildlife Refuge legislation; Progress begins with Presidential signature. Spring Issue: Alabama Nature News. The Nature Conservancy of Alabama. Williams, J.D., A.E. Bogan, and J.T. Garner; foreword by E.O. Wilson. 2008. Freshwater Mussels of Alabama & the Mobile Basin in Georgia, Mississippi & Tennessee. The University of Alabama Press. 908 pg. Bogan, A.E. and J.M. Pierson. 1993. Survey of Aquatic Gastropods of the Cahaba River Basin, Alabama: 1992. Prepared for the Alabama Natural Heritage Program, Contract No. 1922. Boschung, H.T. and R.L. Mayden; Illustrated by J. Tomelleri, Foreword by E.O. Wilson. 2004. Smithsonian Books, Washington. 736 pg. Pat O’Neil. 2002. Geological Survey of Alabama. Tuscaloosa, Alabama. Personal Communication. Onorato, D., R.A. Angus, and K.R. Marion. 2000. Historical changes in the icthyofaunal assemblages of the Upper Cahaba River in Alabama associated with extensive urban development in the watershed. J. Freshwater Ecology 15(1): 47-63.